Responsible production of shale gas will essentially eliminate import of natural gas. That leaves the big ticket item oil. Here too, the notion of independence can usefully be bifurcated into first independence from distant and unreliable sources. 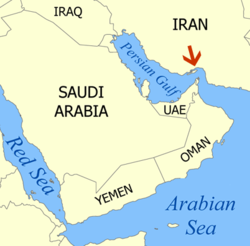 First step to that could be to target the oil passing through the Straits of Hormuz. Iranian saber rattling today concerns that flow. The EIA forecasts that in 2022 we will import 7 MM bpd, down from the 8.1 MM bpd in 2011. I think that if pipelines are built from N Dakota, Bakken oil will eat into this number more than already forecast. But sticking with their figure, first subtract Canada and Mexico. Canada can be expected to ramp up their current flow of 2.2 MM bpd to at least 3.0 MM bpd. We have a special relationship with the Canadians: the bulk of their oil is refined in the US even if some of it is upgraded in country. Aside from the high carbon footprint of this oil, this is a desirable and secure relationship. There is a fair amount of trade in natural gas as well. Mexico currently supplies 0.8 MM bpd. This is at considerable risk of decrease because of the decline in the Cantrell field, but we will leave it at that figure for 2020. This too is heavy oil suited to our refineries. Of the 3.2 MM bpd balance, we estimate about 1.7 MM bpd passing through the Straits. So, one strategy would be to target oil alternatives to that level. Ignoring for the present the fact that a barrel of oil does not generate a full barrel of transport fuel, we can target 1.7 MM bpd of oil replacement. A rough calculation of all sources indicates this is viable, as enumerated below. Sassol, the South African leader in GTL has already announced construction of a GTL plant in Louisiana reportedly rated at 90000 bpd of fuel. Assume at least one other such, bringing the total close to 200000 bpd from GTL emboldened by low gas prices. Alaska offers three distinct opportunities for supplying the Lower 48. One is an abundance of heavy oil near infrastructure in Prudhoe Bay. It suffers from high viscosity and cannot be sent down the pipeline. But it could be blended with two different light oils. One is shale oil, much as is in the Bakken and Eagle Ford. One small company Great Bear Petroleum is reportedly collaborating with Halliburton to deliver this fluid. The other source of diluting fluid is liquid from natural gas. Prudhoe Bay has at least 35 trillion cu ft of recoverable gas that has no market. This “stranded” gas has low value and can inexpensively be converted to liquids using well known methods. The Trans Alaska Pipeline System is currently pumping just over 500000 bpd. When it drops much below this the entire economics of transport are at risk. So there is an imperative to feed more into that pipeline. The measure noted above should accomplish that as well as supply at least an additional 200000 bpd to the lower 48. Long haul trucks switching to LNG or methanol could reasonably target 20% of current fuel usage, which accounts for 0.5 MM bpd of oil. Methanol, ethanol, CNG, biofuel and electric cars could target 1.0 MM bpd. A significant part of this, and relatively straightforward, would be CNG displacement of diesel in metropolitan public and commercial transport. For passenger vehicles methanol appears to be the most advantaged on a cost basis. An angle other than a Straits strategy is a study of the marginal domestic barrel and what it replaces. New domestic oil production is all light sweet oil. This is most like the oil from Saudi Arabia and Nigeria. So that may make sense as the first to be displaced. The Saudi portion is, of course, Straits related and currently stands at about 1 MM bpd. Similarly, the uptick in Canadian oil that we predict will displace heavy crude such as from Venezuela, which currently weighs in at about 0.65 MM bpd. The main point is that crude quality is variable and refineries are choosy, so country strategies have to recognize this. Shale gas produced responsibly will be a key enabler for methanol to be produced at prices attractive with respect to gasoline. Broad scale availability of FFV’s and associated fueling infrastructure will give the public choice. Tomorrow that choice could include other alcohols or methane and a suggested high performance FFV will enable that. Today methanol appears to be particularly advantaged. Ultimately, gasoline (and diesel) can be rendered just another option, not a requirement. And even that portion could be from domestic production. “Responsible” production of shale natural gas??? Is there really such a thing? All engineered systems and processes have failure rates and when fracking fails we risk the contamination of aquifers, as well as the possibility of increasing seismic activity. Plus, even if we’re lucky and there aren’t any engineering failures (click your heels three times and wish very, very hard) were only pushing the problem down the road. We have viable alternatives available right now and they are getting better all the time. We should concentrate on making the switch to renewable energy sources sooner rather than later and even the availability of cheap gas doesn’t change that! I am surprised and disappointed to see you continue to promote the discredited fantasy of “energy independence.” Yes, we can increase (or not) our exploitation of domestic and perhaps Canadian hydrocarbons, but we remain and will continue to remain participants in world markets for all these fuels, and vulnerable to their market forces — as will also be all the other economies around the world whom we rely on for trade in our products and raw materials. The more we can reduce our energy usage and costs, through increased energy efficiency and less need for it to achieve our needs and wants, the better; and the more of it we can produce through renewable domestic sources, also the better, to reduce greenhouse gases and a host of other side effects of hydrocarbon combustion; but please, let’s not keep legitimizing the idea that fortress America can somehow separate itself from world markets. That horse has long ago left the barn, if it was ever even in it. I think that is exactly the debate worth having at the next Breakfast Forum. But to clarify, I was not advocating true energy independence, merely a road to enough self sufficiency so the US does not catch a cold when the Middle East sneezes. I have, and will continue to advocate energy efficiency and oil substitution, which has the knock on effect of reduced GHG in many cases. As to America separating itself from world hydrocarbon markets, it already is, in the case of natural gas; the markets are regional. The effect of self sufficiency in this commodity cannot be underestimated. Imagine having to worry about LNG tankers at risk of travel through the Strait of Hormuz; now we don’t have to. You are currently reading The Road to Energy Independence at Research Triangle Energy Consortium.